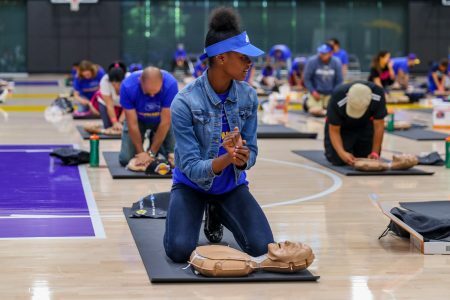 More than 700 kids and adults from around Los Angeles learned how they can help cardiac arrest victims at the first-ever CPR Palooza held at the UCLA Health Training Center: Home of the Los Angeles Lakers, in El Segundo on June 2. 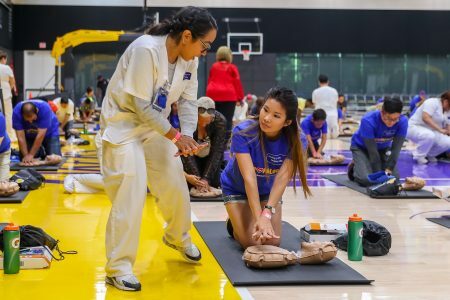 The free, hands-only cardiopulmonary resuscitation basic training was hosted by UCLA Health and the Los Angeles Lakers and taught by instructors from the American Heart Association (AHA). The goal was to teach people know what to do if they are near someone who suddenly collapses from a cardiac arrest. According to the AHA, cardiac arrest is the No. 1 cause of global deaths. 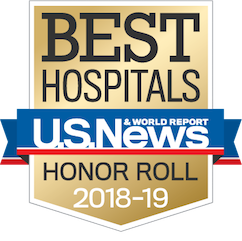 Each year, more than 350,000 Americans experience cardiac arrest at home or out in public and only about 10 percent survive. With hands-only CPR, it is important to first call 911, then to lay down the unresponsive person on a flat surface and begin chest compression by pushing hard and fast in the center of the person's chest at a rate of 100 to 120 beats per minute. (For reference, the Bee Gees song “Stayin’ Alive” is about the same rate). This compression helps to manually pump the blood through the body. Many people are surprised to learn that it’s not necessary to blow air into the person’s mouth using the hands-only technique because the lungs are still filled with air in the early stage of cardiac arrest. Jennifer Malone of El Segundo attended the training with her two sons, ages 10 and 12. Participants received an Adult and Child Anytime CPR training kit so they could practice at home and teach other family and friends. There were also tours the UCLA Mobile Stroke Unit and free blood pressure screenings. The community event coincided with National CPR and Automated External Defibrillator (AED) Awareness Week, which occurs every year during the week of June 1. Event sponsors included the AHA, Gatorade, KIND Snacks, Don Lee Farms and Lululemon. CPR Palooza was part of a yearlong Circle of Health community outreach campaign initiated earlier this year by ABC 7 Eyewitness News, UCLA Health, the AHA, and the County of Los Angeles Department of Public Health Office of Women’s Health.